Packed up and eventually left the campsite around 10am, you'd think I'd try and leave a bit earlier than that but I was on holidays! I was actually trying to leave earlier but I'm just slow at packing up and always double check everything before leaving, I did get a little quicker at this after a while, not too much though. It was an easy day of riding, trying to get into the swing of it all and not think about how far I still had to go, it seems impossible right now that I might make it all the way to Copenhagen. I stopped at a shop and bought some biscuits and water, they were the first two things I saw. The shops out this way have all their goods behind the counter so you need to ask for what you want or in my case just point at what you want, seems to work ok. 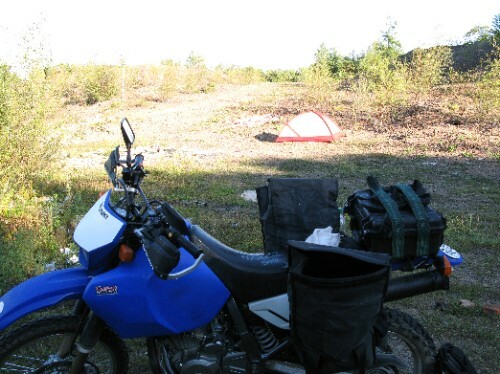 I cruised through Khabarovsk, stopping briefly for some water and biscuits, and found a camp spot just outside of Birobidzahn. I did my trick of waiting around for half an hour before setting up my tent to see who or what was around. It seemed quiet, but just as I started to set up the tent a fella drove up and started to collect some rocks (! ), not sure why, but that is definently what he was doing. The place did look a bit like a small quary crossed with a rubbish tip, it was the first spot I'd tryed and thought about moving on when the rock collector came over for a chat. I managed to explain that I was Australian and not much else when Mr rock lover went back to his car and continued filling up his car boot with stones. I thought he must of been un-impressed. I decided to stay and continued putting up my tent. Rock man finished his gathering and came back over to me while talking on his mobile phone. He came right up to me still speaking on the phone and then, suddenly it seemed, handed me the phone and indicated to speak. What do you say? I said hello and was greeted by a female voice who asked me in very good English where I was from. I told her all the details she wanted to know and before I got to ask her name she wished me luck and hung up. Old mate stone collector smiled like he had just made my day and freaked me at the same time. He had. We shook hands and he took off with a Lada full of stones to who knows where. I finished setting up and cooked myself some packet rice I had bought in Japan. I heard some other people come and go during the night but wasn't bothered at all.